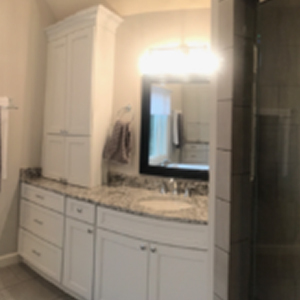 Today I am featuring a master bathroom remodeling project which was tackled before putting this stunning house on the market. 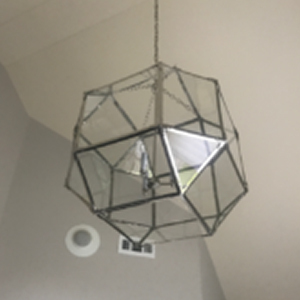 I have been working with the home owners for over a decade, working on their kitchen design, foyer remodel, furniture and custom window treatments in various areas of the house, dining room and living room design, movie theater, wine cellar, gym and kitchen design for the basement area…. etc. It is a beautiful, large home and I have more information for anybody who is interested in seeing this house to purchase it. As you can see below in the before and after pictures, we decided to take out the columns and revamp the layout by not losing any storage, but by adding cabinets on top of the granite counter tops. Not only did it increase the storage space, but also opened up the floor plan and allowed for a different bath tub design. We added new lighting from Visual Comfort Lighting and decided on a gray/taupe color scheme for the walls from Benjamin Moore. 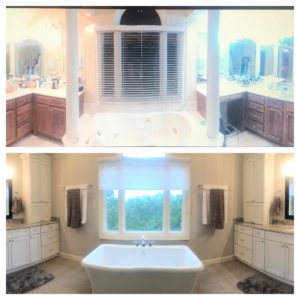 The tile flooring is heated and a new silhouette from Hunter Douglas for privacy was installed.